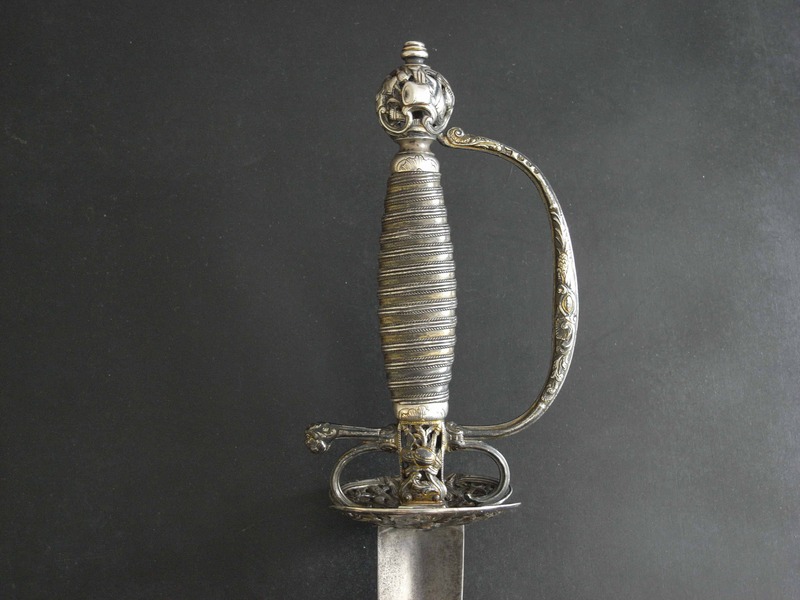 A Scottish basket hilted broadsword in unusually attractive and original condition. 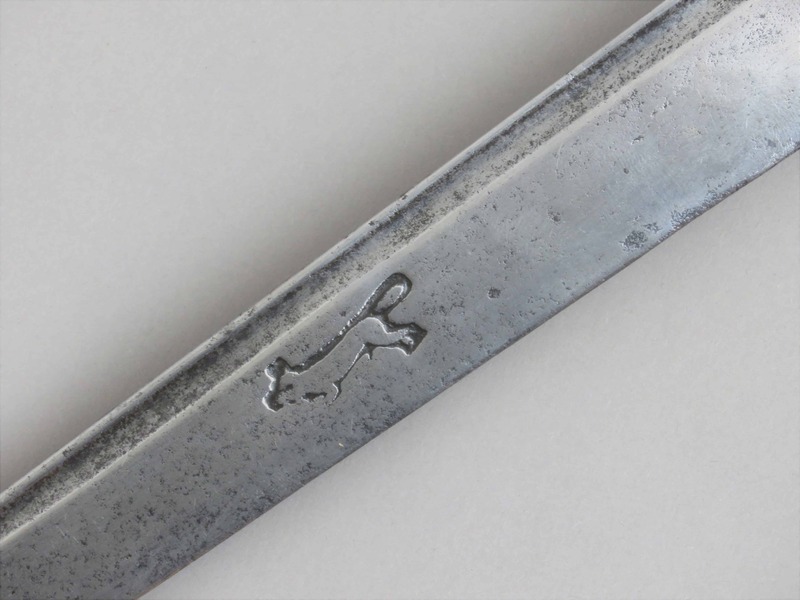 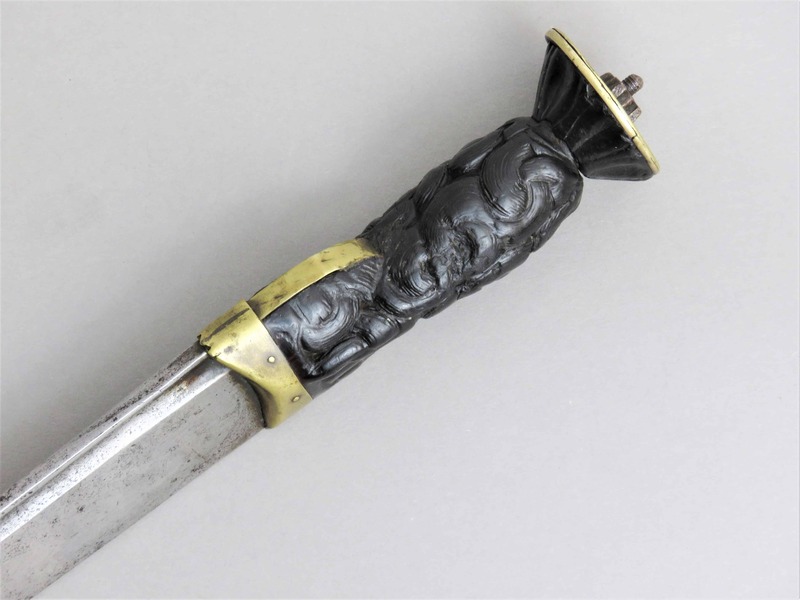 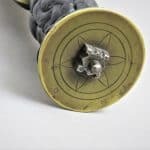 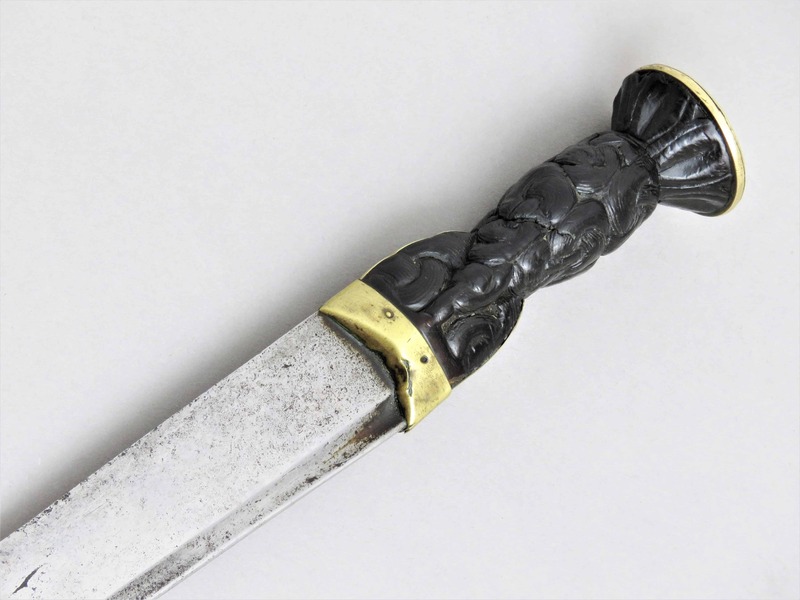 This hilt type is described as “Irische” in English sources from circa 1600 onwards. 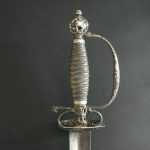 From the English perspective the term “Irische” (Irish) refers to Scots, and English armourers copied the hilt form from a Scottish template which was to evolve further, with differences, across both regions from the late 16th century into the Civil War period, until the fully formed basket hilted sword started to appear. 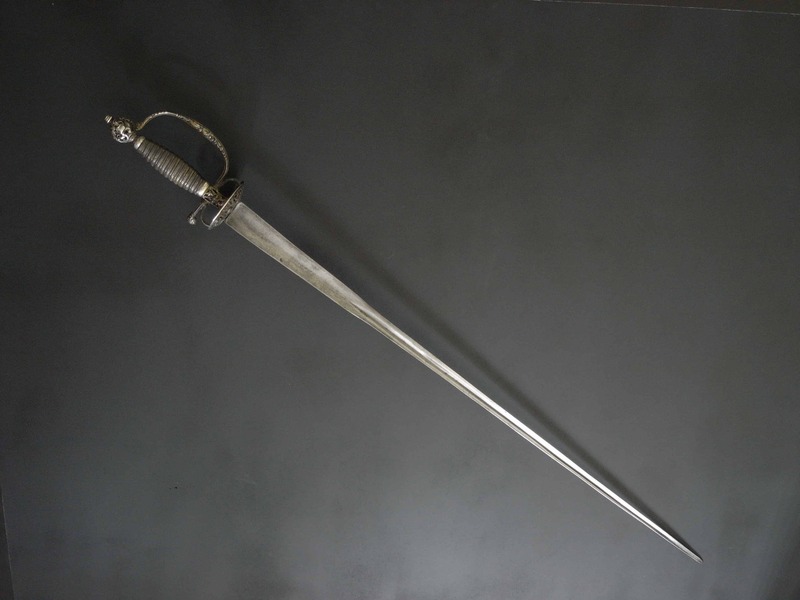 This example, formed with linear patterning to the small primary frontal guard plates, grooved pommel with chiselled circumference for securing the main guard arm terminals, the presence of a rear quillon and slight groove underneath the quillon block intended to help secure the ricasso shoulders of the blade, indicate that this is a Scottish representation of the sword type, rather than English. 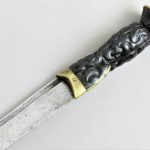 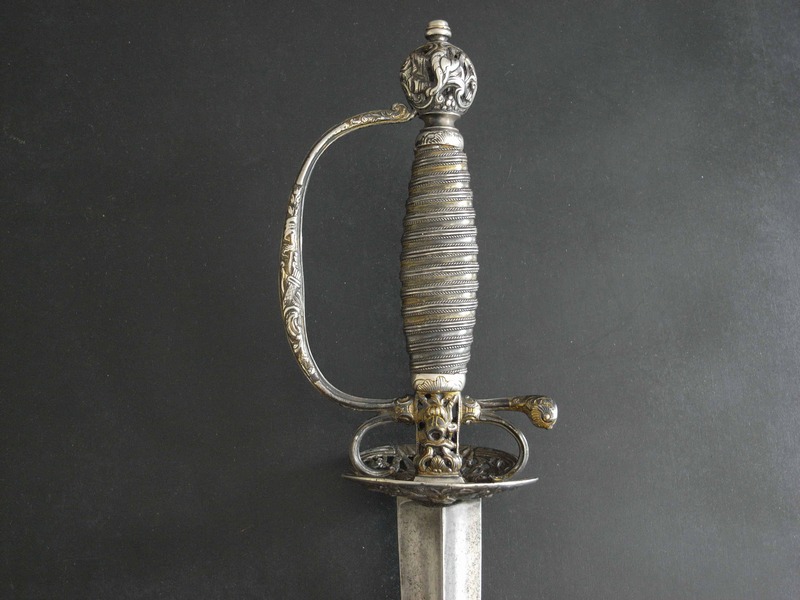 The sword has a dark and attractive original patina overall. 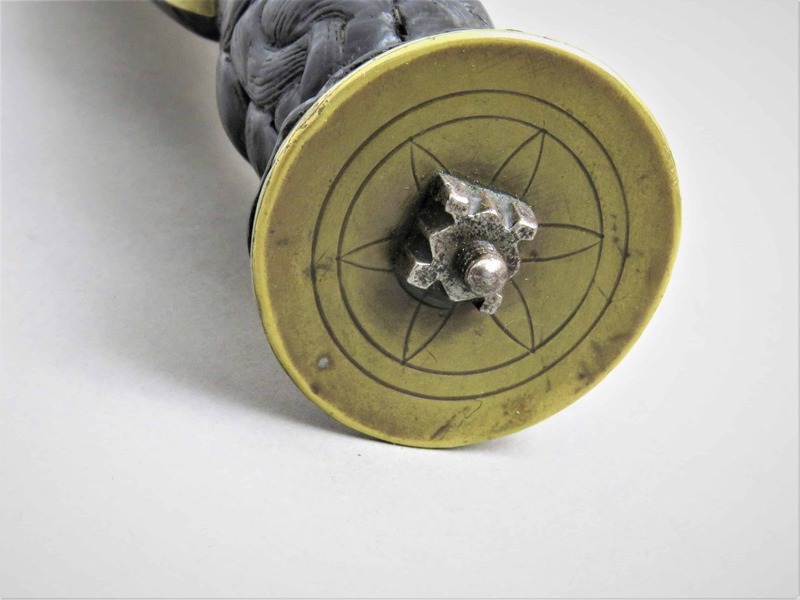 The upper half of the pommel is conical with three sets of triple lines radiating from the pommel button. 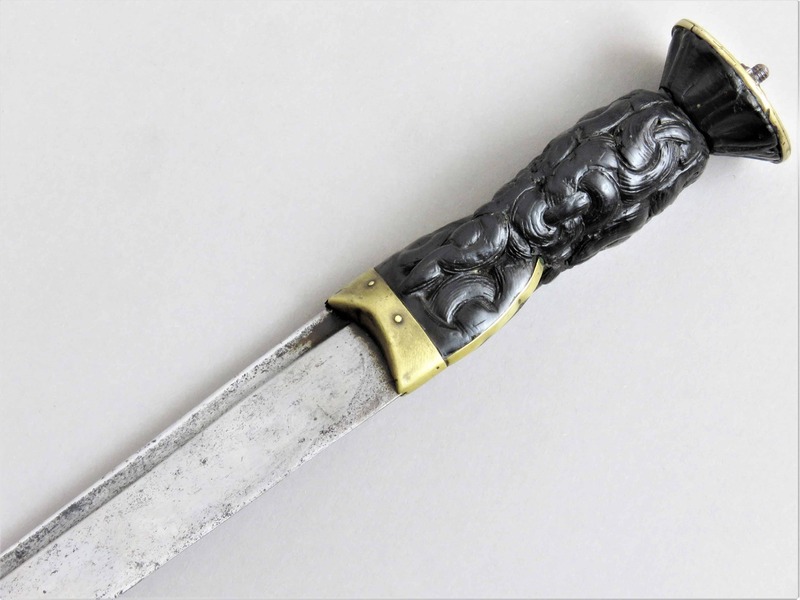 The spirally grooved hardwood grip is attractively patinated, now lacking its original cover and wire binding. 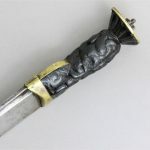 Remains of the original leather liners can be seen at the top and bottom of the grip as well as a leather scabbard mouth protector at the join of blade and hilt underneath the basket. 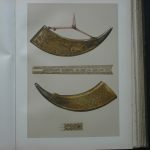 The blade is of high quality, of gently tapering form and flattened lenticular section. 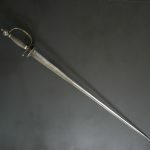 A shallow fuller is present which extends for 6 inches (15 cm) down the blade and is flanked by two deep grooves either side situated in the short ricasso. 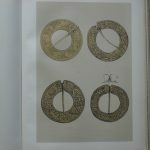 “ANDRIA FERARA” marks are present either side in the central fuller plus thumbnail and dot designs. 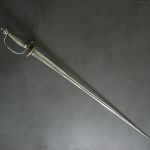 Overall length 41 inches (104 cm), blade length 35.75 (90.5 cm). 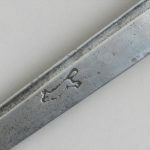 Provenance: Peter Dale Ltd, London, 1990. 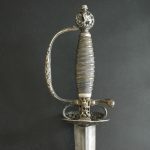 The hilt closely resembles the baskets of a number of swords illustrated in “British Basket-Hilted Swords” by Cyril Mazansky (Boydell Press 2005) and in particular reference D7 page78 which shows a sword at Dean Castle, Kilmarnock, Scotland and D10 page 81, which shows a sword in the Marischall College, in Aberdeen, Scotland. 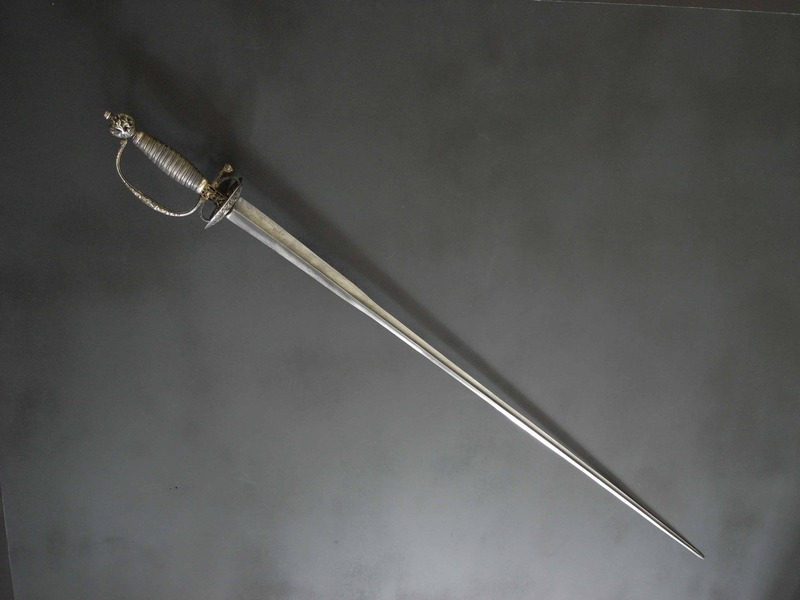 Further references: For further examples of the “Irische” hilt sword type see “British Military swords 1600 to 1660”, Stuart C Mowbray, Mowbray Publishers, 2013, pages 110 to 126. 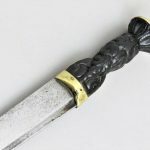 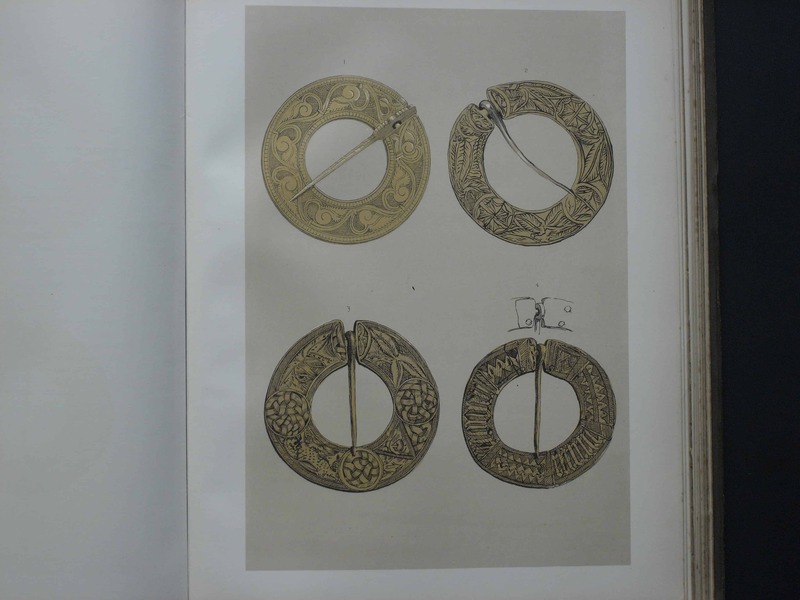 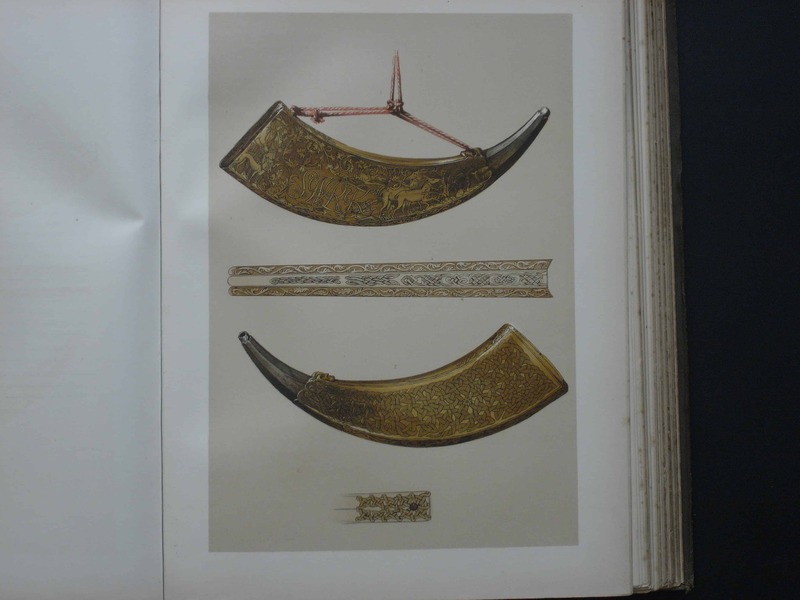 The sword is published in the 2015 Park Lane Arms Fair Catalogue in a paper entitled “Notes on the dating of early Glasgow Style Scottish Basket-Hilted Swords”.